For those of y’all that aren’t already aware (hey new readers, heyyy! ), I started nursing school in May. An actual real-life dream come true! But, there’s a catch. Somehow, some little voice inside of me convinced me to sign up for the accelerated course. Yep… I signed up to finish a traditional 2 year nursing program in 1 year. Post 1st semester update: If anybody happens to find my sanity wondering around…please kindly return to me. I would greatly appreciate it. After that super awesome, super long 2 week summer break that I got…I blinked and now I’m nose deep in Fall semester! Bring on the stress snacks. I find that during the day is the time that I find it the most easy to make wise eating decisions. I usually just pack my (semi) healthy lunch beforehand and I’m set for the school day. h-o-w-e-v-e-r : once the evening rolls around and I’m drowning in clinical paperwork, any food item within a 30 foot radius from me is fair game. With the beaming Texas heat in full effect, I’ve found these Frozen Banana Bounty Bites to be a total life saver and freezer staple for those late night study sessions. In a medium sized bowl, add the chocolate chips and microwave in 30 second intervals until fully melted. Stir in the almond milk until you achieve a smooth and creamy consistency. Line a mini cupcake pan with 18 liners and evenly distribute 1/2 the chocolate mixture into the liners. Freeze for approx 20 minutes or until solid. 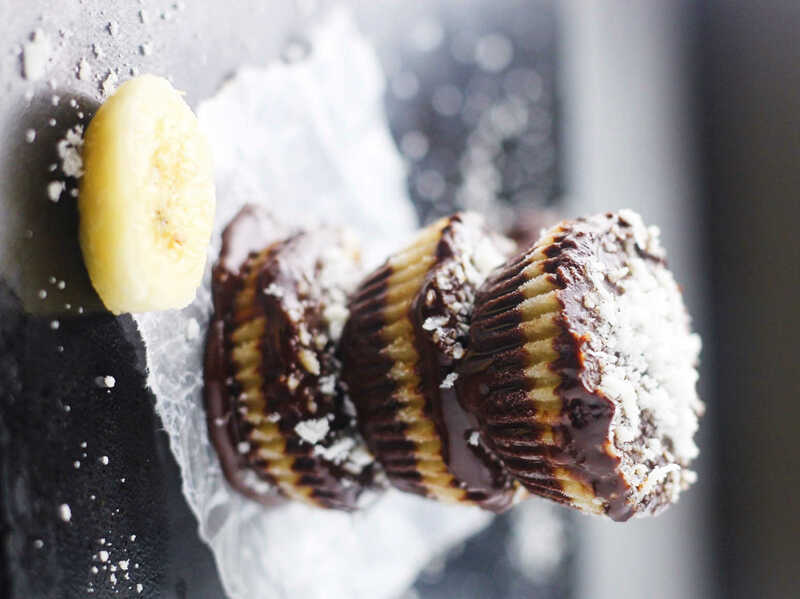 While the chocolate cups are freezing, add the bananas to another bowl and mash - stir in the coconut flakes and spoon approx 1 tsp on top of the frozen cups. Return to the freezer for an additional 10 minutes to allow the coconut-banana mixture to solidify. Finally, pour the remaining 1/2 of the chocolate mixture on top of the frozen banana filling and freeze until solid. Cups must be stored in the freezer until ready to eat. These cups will melt in the refrigerator.